Daily Vote – will Steve Bruce & Wigan Athletic go easy on Man Utd? Seems that Sir Alex Ferguson has no shortage of go-to guys in a crisis. Alan Curbishley (lurking on the right of this photo) ordered his West Ham team to roll over and let United scratch their tummies – “Lads, me and Alex are in this wine club, so don’t do anything to piss him off, right…” – and now Fergie can turn to former captain Steve Bruce. 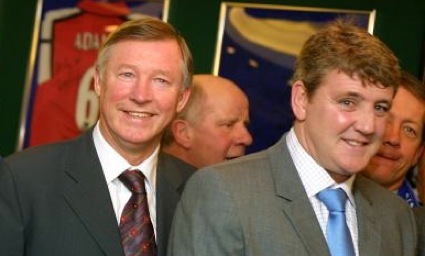 Will Steve Bruce do Fergie a favour?